A review of last year looks at the ways in which we have fulfilled our purpose in all our areas of responsibility, and the way in which they will evolve in future as we implement our policies. We are determined that the Delhi Medical Council will continue to meet the needs of the society and will merit and maintain the confidence of the public and the profession. One of the major thrusts is the introduction of renewal of registration, which will require our registered practitioners to demonstrate that they remain up to date. We have succeeded in our endeavour of providing an equitable platform for the users and the providers of health care services. Compliance of the law of the land : The Council took steps to disseminate information about the provisions of Delhi Medical Council Act and extensively emphasized on it through print media, at medical professionals associations meetings, through correspondence with the Heads of medical institutes and hospitals. Awareness was created amongst the medical fraternity. The fraternity has reposed its faith in the Council by coming forward for registration in large numbers. Initiative was taken by the Council by arranging for Field Camps at various medical colleges and institutes to facilitate registration of doctors with Delhi Medical Council. In compliance with the provisions of Delhi Medical Council Act, the State Medical Register of medical practitioners registered with the Council was notified on 28th November 2002. The medical professionals have welcomed and responded positively to the concept of Continue Medical Education and the Council has accredited a total of 816 CME programmes. In order to achieve better connectivity with the registered practitioners and public the Council launched its website, "www.delhimedicalcouncil.nic.in"
The Council through its fair and transparent functioning has not only established its reputation amongst the medical fraternity but also has won the confidence of the public, the investigating agencies and the courts of law. The Council is leading a crusade against the self- proclaimed doctors, "Quacks", to free the State of Delhi from their menace. In this mission it has been coordinating with the Directorate of Health Services to bring these charlatans to book. We have issued more than one hundred show cause notices to quacks. Prosecution proceedings have been launched against quacks in the courts. We have been able to sensitize the judiciary and have evolved procedures to simplify the executive and judicial process to book these offenders. As a result many quacks have been arrested, some have been denied bail. A request has been made to the High Court of Delhi through the Delhi Govt. to appoint special magistrates for speedy trial against quacks. We propose to request for amending laws so that trial proceedings against quacks are done expeditiously. We set the standards of professional practice by describing what is expected of doctors, in their day to day conduct &performance, by the profession and by society .To achieve this objective the Council formulated the Code Of Ethics for medical practitioners practicing/servicing in the NCT of Delhi. Treat every patient politely and considerately. Respect patient's dignity and privacy. Listen to patients and respect their views. Give patients information in a way they can understand. Respect the right of patients to be fully involved in decisions about their care. Recognize the limits of your professional competence. Respect and protect confidential information. Make sure that your personal beliefs do not prejudice your patients' care. Act quickly to protect patients from risk if you have good reason to believe that you or a colleague may not be fit to practise. Work with colleagues in the ways that best serve patients' interest. In all these matters you must never discriminate unfairly against your patients or colleagues. And you must always be prepared to justify your actions to them. For the first time in India Delhi Society for Promotion of Rational Use of Drugs in collaboration with WHO published "Standard Treatment Guidelines". This publication was very well received amongst doctors in India, and as a part of collaborative efforts between Delhi Medical Council and DSPRUD these guidelines were distributed free of cost to registered practitioners of Delhi Medical Council in order to promote and create awareness among them regarding the need for rational use of drugs. On the request of Govt of NCT of Delhi this study was done by National Council of Applied Economic Research under the supervision of Delhi Medical Council. The study projects the needs of Health manpower for the NCT of Delhi till the year 2020. The report has been submitted to the Govt of NCT of Delhi. The meeting was also attended by the representatives from the Medical Council of India and an observer from the Government of India. Registration: After detailed discussion, it was decided that registration should be for a period of five years at a time and should be done by the doctors with the State Councils in whose jurisdiction they are practicing. This registration should be renewed every five years based on the doctors attending 100 hours of Continuing Medical Education programmes during the five years period. 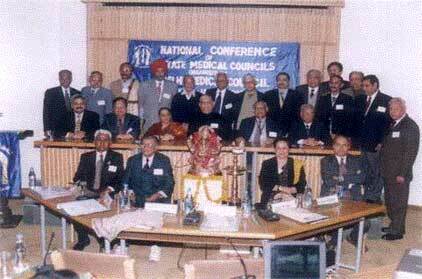 The Presidents of State Medical Councils should be represented on the Medical Council of India therefore, it is recommended that all Presidents of all State Medical Councils should be Members of Medical Council of India and can be nominated from each State under the provisions of sub-section (c) of Section of 3 of the Indian Medical Council Act. The Indian Medical Council Act has out-lived its utility and needs to be reviewed once again. The Indian Medical Council Act may be suitably amended in consultation with all State Medical Councils keeping in view center state relationship as envisaged in the Sarkaria Commission Report. Funds for CME are being allocated by the Government of India to the Medical Council of India. These may be disbursed to State Medical Councils to promote CME activities in their respective States. The Indian Medical Council Act under Section 15(2) envisages registration by State Medical Councils on the State Medical Register; hence Medical Council of India should not register doctors directly. State Medical Councils to share information amongst each other regarding disciplinary action taken against any delinquent medical practitioner. The press may play a responsible role in handling information regarding complaints against doctors. Media trials prior to decision of appropriate authorities are highly damaging to the doctors and eventually affect the society at large. Para 1.2.3. of the Indian Medical Council (Professional Conduct, Etiquette and Ethics) Regulations, 2002 should be amended so as to make it mandatory for medical practitioners to attend at least 100 hours of CME programmes over a period of five years instead of 30 hours as provided in the present regulations. Your access to and use of this website ("Site") is subject to your compliance with all applicable laws and the following terms and conditions. © Delhi Medical Council. All rights reserved. Design by : Primus IT Solutions.